Smartseal supply a range of high quality, effective non-synthetic oil spill removers for concrete, tarmac and block paving. Our oil removers are not detergents and actively bio-degrade oil stains with live bacteria. Usually one treatment of oil remover is sufficient but for older ingrained oil stains a second treatment may be required. Oil remover will remove 90-95% of most oil stains* on block paving, concrete and tarmac but some slight residual staining may be present. An application of sealer or coating will help to mast any residual staining once treated with oil remover. 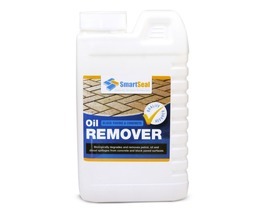 Best oil remover for block paving and tarmac. 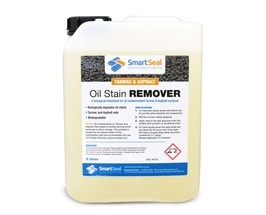 Smartseal are suppliers and stockists of high quality oil removers to remove oil stains and patches on driveways laid with block paving, concrete and tarmac. Oil is very hard to remove using traditional detergent based oil removers on porous concrete and block paving as the oil will seep quickly into the pores. Our bio-degradable oil removers have active live bacteria that effectively 'eat' oil and other petrochemical contaminants such as diesel.